The central theme explored at the recent annual conference of the Australian Historical Association was ‘The Scale of History’. The organisers asked participants to consider how questions of scale—temporal, geographical, social, archival—influence their research. The theme resonated strongly with me, having recently grappled with the vast geographical, temporal and spatial scales of ocean history while writing Wild Sea: A History of the Southern Ocean (NewSouth, 2018). Environmental historians are inclined to venture into subject areas that require them to embrace vast scales of time and place, and this is particularly so in the case of ocean history. In geographical terms, the world’s five major ocean basins—the Pacific, Atlantic, Indian, Arctic and Southern Oceans—form part of an interconnected planetary ocean covering three-quarters of Earth’s surface and containing 97% of all its water. Added to that is the fact that oceans are three-dimensional environments, stretching from the atmosphere to the depths of the ocean or, as the North American historian Eric L Mills described it, the ‘two great masses of fluid on the surface of the earth’. The temporal dimensions of ocean environments are equally vast, evolving as a result of the physical transformation of the planet in deep geological time. The Southern Ocean occupies the southernmost region of this vast three-dimensional environment. It had its origins in the long, slow movements of Earth’s crust as it shifted and compressed and fractured over 3.5 million years. Around 40 to 20 million years ago a rift opened between Australia and Antarctica. Ocean water flooded in from the west marking the end of a continental bond that had lasted for millions of years. Thus was formed the Antarctic Circumpolar Current, which flows entirely around Antarctica south of Australia, New Zealand, South America and South Africa. It is the least known and least visited of the world’s oceans. Apart from a series of about 20 tiny, mostly volcanic subantarctic island groups that dot the surface of this circumpolar ocean, there seems to be nothing but water, wind, atmosphere, ice, and the myriad of creatures that call this tempestuous region home. An ecologist recently asked why I had written a history of the Southern Ocean. As he put it, how could an ocean have a history when ‘no-one lives there’? Historians do favour terrestrial environments, and I found this to be equally true of the high southern latitudes where the Antarctic continent—rather than the ocean that surrounds it—has taken centre stage in polar histories. Nevertheless, there is a growing interest in writing ocean history amongst environmental historians, particularly given the emerging sense of an environmental crisis in the world’s oceans and the imperative to understand the history of human-ocean relationships. As the American ocean historian, Helen Rozwadowski has argued we need to historicise the ocean itself because ‘even those are as intertwined with human history as the far corners of the terrestrial world’. My first impulse was to view the Southern Ocean as a place, to explore it as a three-dimensional environment rather than to just focus on its surfaces and edges. From my work as a public historian I was used to grounding my writing in a sense of place. Therein lay my first challenge. The Southern Ocean is characterised by currents and gyres and eddies representing the restless movements of water on a massive scale. How could I distill a sense of place in such a complex, fluid, dynamic environment? I decided to experiment with a different approach, putting the ocean at the centre of the narrative and writing from the midst of those winds and currents and fog and ice for which the Southern Ocean is notorious. The idea of shifting the historical gaze from land to sea is not new. In 1995 the French historian, Fernand Braudel, employed a similar idea in his long durée history of the Mediterranean Sea in the age of Philip II. Unlike the more conventional event-based histories, he was able to discern slow and subtle changes in the relationships between people and the Mediterranean environment over time, revealing how the Mediterranean was not a single place with a single history but rather a complex environment with multiple histories. From my vantage point in the midst of the Southern Ocean’s circumpolar storm track, I found it invigorating to navigate between the ocean’s natural and cultural histories, traversing back and forth across vast scales of time and space. Importantly, I could explore the history of the ocean both above and below its surface, catching glimpses of a vessel on a perilous voyage, of an individual sailor seeing his first ice berg, of a polar explorer’s encounter with an emperor penguin colony, of an oceanographer discovering the tooth of a prehistoric shark alongside the remains of coal from a steamer, or of a scientist puzzling over the long-distance migration of a floating island of giant kelp. I also found that the Southern Ocean was inhabited, not only by water and wind and marine creatures, but also by stories and legends that reflected different historical and cultural relationships with the ocean. With the ocean at the centre of the narrative, I found that its winds, currents, ice, islands and depths offered a natural framework for the chapters. It also offered unexpected insights. Almost from the start, my perspective challenged the conventional north-south orientation of Western sources and histories of exploration and colonisation in the southern hemisphere. My story assumed a west-east orientation because it was impossible to examine the environmental history of the Southern Ocean without being caught up in its powerful westerly winds and circumpolar current as told through diaries and logbooks, images and stories. This brought into sharp focus local places and societies and relationships with the ocean, producing a distinctively Southern Hemisphere perspective and a heightened sensibility towards its human and non-human inhabitants. There are, of course, many histories of the world’s oceans, although they tend to privilege narratives that focus on the ocean surface as a highway for maritime communication, trade and war and as a resource for exploitation. It struck me that, by putting the Southern Ocean at the heart of the narrative and attending to its natural history as well as its human history, I was giving it a sense of agency. So my story weaves back and forth between people and place, between human encounters and the seasonal heartbeat of the sea ice that surrounds Antarctica, between scientific expeditions to understand the deep ocean and the distinctive characteristics of species like kelp and krill, between Indigenous peoples and their ancestral relationships with the sea. This interweaving of natural and cultural histories enabled me to move more easily between global and local scales of storytelling as well as between deep geological time and recent human history. In order to deal with these extremes of scale, I chose a particular species or person or event that offered a portal into a larger story. I tell a story, for example, about the Wandering Albatross which has the longest wingspan of any bird. GPS tracking has shown that they can fly up to 15,000 km across the Southern Ocean in these ‘albatross latitudes’. By focusing on the albatross I could examine cultural perceptions of the winds known as the Roaring Forties, the history of interactions between albatross and science in the high southern latitudes, the Western legend of the Rime of the Ancient Mariner, and Indigenous cultural relationships with the albatross, as well as illuminating the bird’s own natural history and current threats to its survival as a species. In this way, I was able to explore different forms of environmental knowledge and different ways of knowing the Southern Ocean. I was also able to trace the emergence of an environmental awareness of the ocean’s vulnerability to human actions, from the theatres of slaughter that devastated fur seal populations on remote subantarctic islands in the nineteenth century, to the exploitation of whales and Antarctic krill in the twentieth century and the more recent recognition that the Southern Ocean is changing in response to global warming. Indeed, for Southern Ocean scientists it has become a barometer of global warming. I discovered a great paradox in the Southern Ocean. It is renowned for being stormy and remote and inaccessible but, in reality, everything is interconnected in this ocean—currents, winds, ice, creatures, plants, islands, continents and people, past and present, nature and culture. I have come to think of this awareness as a kind of ‘ocean consciousness’ which was apparent in earlier books and reports about oceans, before air travel replaced long distance sea travel. In the 1950s, for example, scientists like the US marine biologist Rachel Carson and oceanographer Hank Stommel were writing about oceans and their natural and cultural histories in a lyrical and engaging way, attracting wide publicity and enthusiastic lay readers. I think that perhaps we lost that ocean consciousness somewhere in the postwar era, in the Southern Ocean at least, at a time when scientific specialisations began to portray the region as a kind of international field laboratory. In the process we also lost its stories. So my project has really been about recovering some of those stories, revealing the three-dimensional ocean environment as a place of entangled histories—both natural and human—engaging people emotionally and through the senses, through the interweaving of cultural beliefs, scientific ideas, ocean conservation politics, and the more conventional themes of maritime exploration and exploitation. In this way, I have sought to locate the Southern Ocean within a spatial and temporal context to create a deep history, as well as to reveal encounters between humans and species that draw us into a more nuanced understanding of this extreme, opaque yet vulnerable more-than-human world. Wild Sea: A History of the Southern Ocean will be launched at the 2018 Canberra Writers’ Festival by Caroline Le Couteur, MLA. The event is FREE but an RSVP to joymccann@grapevine.com.au will be appreciated. Eric L Mills, ‘Creating a global ocean conveyor: George Deacon and the hydrology of the Southern Ocean’, in Keith R Benson and Helen M Rozwadowski, eds, Extremes: Oceanography’s Adventures at the Poles, Science History Publications, Mass., 2007, p. 107. Helen M Rozwadowski, ‘Oceans: Fusing the history of science and technology with environmental history’, in Douglas Cazaux Sackman, ed, A Companion to American Environmental History, Blackwell Publishing Ltd, West Sussex, 2010, p. 442. Fernand Braudel, The Mediterranean and the Mediterranean World in the Age of Philip II, University of California Press, Berkeley, 1996. 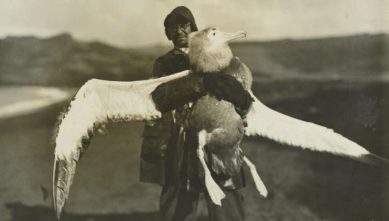 Dr William Ingram, medical officer and biologist with two British, Australian and New Zealand Antarctic Research Expeditions (1929-31) holding a young albatross captured at Crozet Island, circa 1930. Photo: Frank Hurley. Source: National Library of Australia. Naturalist reading deep-sea thermometers during the scientific voyage of the HMS Challenger (1872-6), 1880. Source: National Oceanic and Atmospheric Administration. Joy, I have really enjoyed the structure of the book: thank you.